Bio: Home-schooled on Hendrix, Clapton and Free but in search of a more contemporary sound, guitarist Ozzie Rodgers formed The Manic Shine in early 2009 with the express intention of combining the vitality and soul of classic rock with the intricacy and experimentation of a distinctly modern sensibility. Having previously performed at Dubai Desert Rock Festival 2006 alongside Megadeth, 3 Doors Down and Reel Big Fish, Rodgers' craving to form a band with a big sound was set from an early age. The band are rapidly gaining an avid following for their energetic live performances around the UK, where the band sounds vigorous and kinetic, an unstoppable freight train hurtling at a rapid pace. 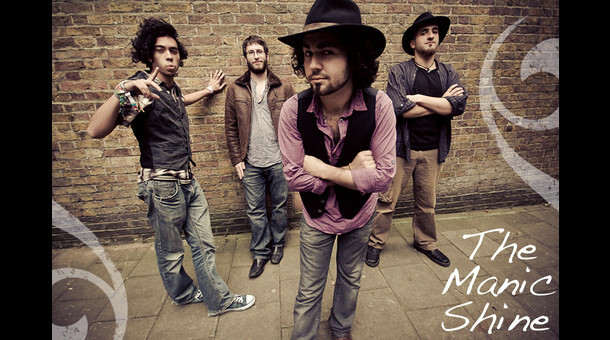 The band set feet tapping and bodies moving with their hard-hitting, undeniably groovy, electro-tinged, blues rock. The future can only be bright for the Manic Shine, and with sights firmly set on conquering the UK scene, the band bid you welcome to the new-school feel with an old-school vibe. Welcome to Rock with roots as deep as they go and branches high as the sky. Welcome to The Manic Shine.